From 14 to 16 November 2016, a series of consultative meetings were held in Abuja in the framework of Nigeria’s National Baseline Assessment on Weapons and Ammunition Management (WAM). The events were hosted by the Presidential Committee on Small Arms and Light Weapons (PRESCOM) and organized by the United Nations Institute for Disarmament Research (UNIDIR) and BICC. The workshop was attended by representatives of the Office of the National Security Adviser, the Department of State Services, the National Intelligence Agency, the Defence Intelligence Agency, Nigeria’s armed forces and other security services (immigration, Prisons service, Nigeria police, customs, civil defense). The objective of the series of seminars was to assist the Nigerian government in establishing a baseline of the existing national weapons and ammunition management framework in line with international voluntary guidelines and standards, namely the International Small Arms Control Standards (ISACS) and International Ammunition Technical Guidelines (IATGs). This baseline will help identify existing national capacities and areas to be strengthened and inform possible arms control options and approaches to strengthen the national WAM framework in Nigeria. On the last conference day, preliminary results of the series of seminars were presented by PRESCOM to the Office of the National Security Adviser (ONSA) in form of a road map. 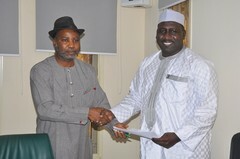 Receiving the document on behalf of ONSA, the Director of Policy and Strategy, Mr. Umaru Abba acknowledged the need to tackle arms and ammunition management in Nigeria in a more comprehensive manner. He moreover stressed that ONSA would do everything possible to ensure that the recommendations provided in the weapons and ammunition management baseline report would be acted upon. The final results of the WAM assessment are expected to form the basis for future activities by the Nigerian government and international partners in strengthening the arms and ammunition management in the country.